The engine is a 306 with GT-40X heads.. it seems it has full studs thru out. Trick flow upper and lower..Vortech with a air to air. Silver exterior with sunroof and black interior. It has some rust issues nothing major, frame rails are perfect...mostly scale from harsh NE weather on floor pan. Here are some pics of what it looked like when i got it and after we started pulling it apart after mocking up the air to air piping.The plan is to pull the engine and trans next week end and start the cleaning process. Looks good Chet. Keep us updated on the progress of this build. What are you doing to the motor while it's out? What happened to the front quarter? Car get hit? Nice, Chet. Glad to see updates. Silver foxes look great. Are you going to try to paint it yourself? Chet good to see you starting on the car!! Let me know if you need any xtra hands we can work out a time. If this is going to be a track car I would remove that intercooler and piping. To many close bends is not ideal for boost levels and flow. I would just run the normal Vortech setup for a Fox Body with a power pipe and the largest air filter you can find. We are going to clean up engine maybe a little polishing....also some investigation to find out exactly what the engine is. as for the front quarter the fender had some rust issues so i had a fender from a GT kicking around. Just a quick rattle can primer for now. i will paint the engine compartment with some help from my buddy Todd @ Amherst street Collision https://www.facebook.com/AmherstStreetCollision. Trying not to paint the entire car.... paint is in really good shape except the fender and a small spot on rear quarter. Mike I understand what you are saying but we are not planning on breaking any records or drag racing full time just looking to do something different. The supercharger had been modified so using the normal way would require a complete u turn pipe or sending it to Vortech to have the compressor housing replaced. Luckily if it doesn't work out it's easy to remove. This was all for mock up we are planing on making it flow better with easier bends and less joints if possible. Cool, Cool, and very Cool!! I recall you and the boy, numerous times at various meets....checking out wheels here, motors/combos there, brainstorming and scheming together. Really got me chuckling, as I knew you were up to something. From what I can tell the fun has already begun!! 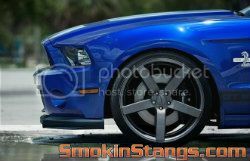 PS: I think SmokinStangs Laconia - 2012, is going to see some cool builds appearing on the scene!! We had some time to work on the 93 this week end, here are a few pics of what we got done..found a few surprises but no big deal it. The rear main is leaking (surprise,surprise) and the clutch is just about done. Planned on replacing both anyway found some rust holes in the floor nothing a welder cant fix. I dont think the TRANS MOUNT HAS BEEN OUT SINCE 93?? bolts broke with out even trying. I ordered some parts they should be here before next week end and my vacation. Hope to get the engine bay looking alot better by the end of the year. We have some good ideas now just time to make them happen.